POOT M, FIJN R & SCHOTEN H (2016) Aerial survey of Great Crested Grebes Podiceps cristatus along the Dutch mainland coast in February 2011. 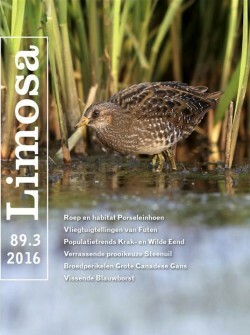 LIMOSA 89 (3): 108-119. On 21 February 2011 an aerial survey of Great Crested Grebes was carried out along the coast of Holland to assess how well the thousands of Great Crested Grebes can be counted from the air. The maximum number of grebes known to winter in this area is over 30 000 birds (about 10% of the total Northwest-European population), but variation between years is large. The area is thus far not protected and the species is not well covered in the yearly monitoring program of the Dutch government (mwtl). The count was conducted in a twin-engine airplane without bubble windows. The main survey design consisted of transects of 6 km length perpendicular to the coast in the concentration areas of grebes. Birds were recorded in four distance strips. Grebes are known to dive in response to an approaching, low-flying survey airplane. Consequently, relatively few birds were seen in the first distance band. If this is not taken into account the distance-dependent detection probabilities are overestimated. We present five different estimates of total population size and consider that the best estimate (10 592, 95%-C.I. 4 510-25 125) was achieved with a left truncation of the survey data, excluding the first distance band. Systematic observations of flying grebes from eight migration observation sites showed that the aerial survey was conducted well after the usual midwinter maximum of grebe presence. Furthermore, the winter of 2010/2011 was mild with probably relatively low numbers, possibly explaining why our population estimates were only 25-35% of the maximum number recorded along the Dutch coast.